Online Marketing on Time All the Time Discover the Best times for posting to Blogs, Facebook, Twitter, Email Marketing and other Social Media. 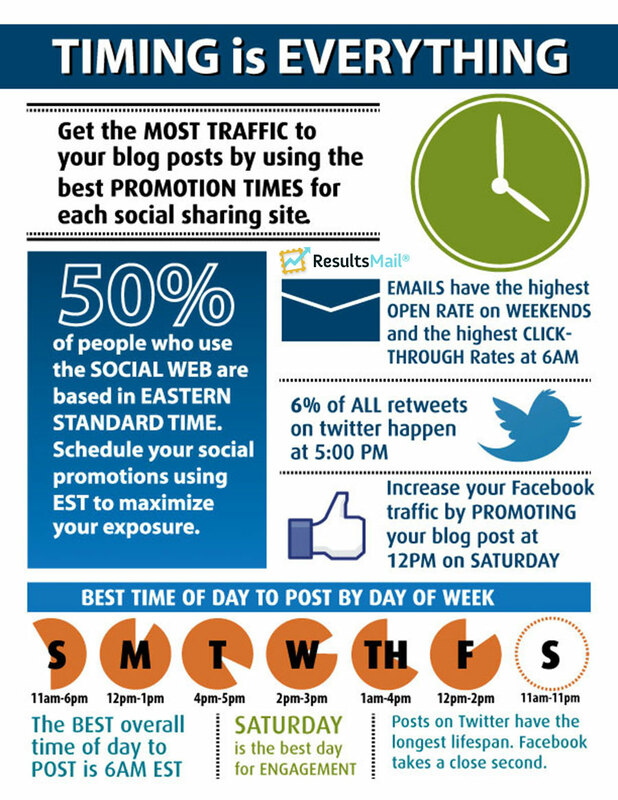 Discover the Best times for posting to Blogs, Facebook, Twitter, Email Marketing and other Social Media. Online marketing is the key to the success of your website. But when is the best day and time of day to start marketing online? This depends on how and where you market your site. To get the most traffic from social media you shouldn’t just promote your blog posts on all social sites at the same time. 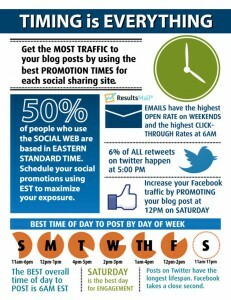 Make sure you use different promotion times for each social site. Timing is important for just about everything and there is no exception when it comes to online marketing. Once you get comfortable developing content for your website, you need to start thinking about how and when it should be introduced into the social media. If you do not, you could jeopardize the success of the entire campaign. I do not mean to be over dramatic, but it is important to consider how timing can affect things. If an actor or musician’s timing is even slightly off, the performance can be a disaster. If a gymnast, UFC fighter or a skateboarder doesn’t execute perfect timing, they could injure themselves very badly. Network advertisers know how important it is to time marketing campaigns down to the minute in each specific time zone. They must, because if a campaign doesn’t reach its target market, it could be useless. The same can be said for advertising online via email or social sites, but with a major caveat. While traditional marketing interrupts, online marketing asks permission. Traditional marketing interrupts followers. Look at a TV commercial or a print advertisement for example. You might be watching a game on TV, or flipping through a magazine, and every couple of minutes or pages you are interrupted with an advertisement. You can choose to ignore them, but it doesn’t mean they are going to go away. Online marketing on the other hand requires that you first ask permission to get someone to open an email or share information through social media. If an online marketer interrupts someone, that person will most likely ignore what they are saying, delete the email or worse, flag the email as spam. In order to get the timing right when marketing online, keep in mind that not everyone is in the same time zone. The three hour difference between the West Coast and the East Coast of the United States is a large enough window to miss an opportunity. If you are marketing nationwide it is very important to keep this in mind. An email marketing campaign sent to the morning crowd on the West Coast will hit the inbox on the East Coast when everyone’s out to lunch. To avoid this problem, try to set your social marketing schedule to the Eastern Time Zone. If you are going to post everywhere at the same time, try 6AM Pacific Time. This will get your East Coast audience early and be the first thing your West Coast audience sees when they log on in the morning. It all starts with the content that you are developing for your website that, in most cases, will be uploaded to your blog. According to Dan Zarella’s survey of 1,400 bloggers, most people tend to read blog posts in the morning before work or when they just get settled into the office. Moreover, HubSpot analyzed 17,000 blogs and found that Monday and Thursday are the best days for posting blogs, as these days tend to attract the most comments. If you are uploading fresh content to your blog every single day, than the best time of day to have the content uploaded is around 6 AM Pacific Time. If you are only uploading new content once a week to your website and want to get the most comments and traction, than you should consider doing it on Monday or Thursday morning around 6 AM Pacific Time. To get the most traffic from the social web you should not just promote your blog posts on all social sites at the same time. According to Twitter, 6% of all re-tweets occur during the work week at 5pm Eastern Time. This is the time of day when many Twitter users are wrapping up their day or killing time just before they leave the office. If you are going to use Twitter as an avenue to promote your website, which you should highly consider doing if you have not already, then I would recommend sending out tweets anytime between Monday and Friday around 5pm Eastern Time. Facebook is an entirely different social animal than Twitter. Facebook posts get the most shares on Saturdays around noon when users are relaxing at home from their busy work week. If you want to reach the most people on Facebook, then try holding off marketing your newsletter or blog post until Saturday afternoon. Give your customers a little time to settle into their weekend, a moment to relax, and then hit them up with your promotion around lunch time. Facebook and Twitter are great tools to promote your website, but they are not the only ones out there. If you are using a marketing image or a video, then you should also consider using some of the other social sites that are available for these specific types of promotions. One site that has been gaining popularity for promoting images and image sharing is Instagram. According to Instagram statistics, if you are going to upload an image to Instagram, the best results for likes will be on Fridays and Sundays between 7-8am. Video marketing is also gaining momentum and many online marketers are using videos to promote their websites. According to some Youtube reports, the best time to upload a video where it has the opportunity to get the most views is during the week on Wednesday or Thursday. The best time of day to upload your video is between 12-1pm. Keep in mind that it can take up to an hour to upload and process your video on Youtube. Email statistics are interesting and tend to vary depending upon what type of email is being sent. If you have implemented an email campaign and want to optimize how many people open and click-through your email, knowing the best time to send out your email blast is an important aspect to ensure email success. One thing to keep in mind is that B2B and B2C audiences are largely the same. This may be surprising to some, but not when you consider that very few individuals separate their work emails from their personal emails. This means that businesses are consumers. Keep in mind emails sent with the highest click-through rates may be different for your target clientele than others. When marketing your website via email, you should always be vigilant about checking each email campaign’s statistics while testing different days and times to find out what works best for your particular industry. On the whole, study groups and research have found that the best day of the week to send newsletters or marketing messages with the highest click-through rates is not necessarily during the work week like we have been lead to believe in the past, but on Saturday and Sunday. This may come as a shock to some traditional online marketers; however, the logic for this may be simpler than you think. If your subscriber’s personal email is also their work email, then there is a good chance that they will be checking their email on the weekend. People have more time to read their emails and click-through to articles in the comfort of their own home, not during the week when they are at work and pressured with supervisors, projects and deadlines. The best time of day to send a newsletter or promotion is in the morning, because this is when most people take the time to read it. The best click through rates come from emails that are sent at 6:30 AM. When it comes to email marketing, it is also very important to keep control on how many emails you are sending out. if you send too many at once, you’ll notice that you’ll get a lot more complaints compared to if you only sent out a few. For example, if you are sending out 100,000 emails, it would be better to break down your list and send out blocks of 25,000 instead of all 100,000 at once. This will help with deliverability, sender reputation and performance analysis. What might be the best times for some industries may not be the best time for others. If your target market is teenagers and young adults, you may not want to send them an email at 6 AM. If you are marketing a target area like a city or county, you will want to have a more localized campaign geared towards that area. Look at the times zone and how customers react to the email campaigns. When all is said and done, you can always check your site’s analytics and reports to see what is working best in your market. Don’t forget to review your ResultsMail email statistics to find out what day or time you get you the most click-throughs on your email blasts. If you need help promoting your blog, try the ResultsMail subscriber form to collect emails from your current customers. You weren't being dramatic about the timing. Timing IS a huge deal in online marketing. Bookmarking this and perhaps use it as reference. Thanks!